Description: An oven for firing tiny crumb sized clay objects based on the fact that a candle burns at around 1100 degrees Celsius. The oven is easy to build and be constructed by using everyday common tools and objects with one exception to the professional ceramic oven pipe like props, which are mostly available (as far as I know) in northern Europe. 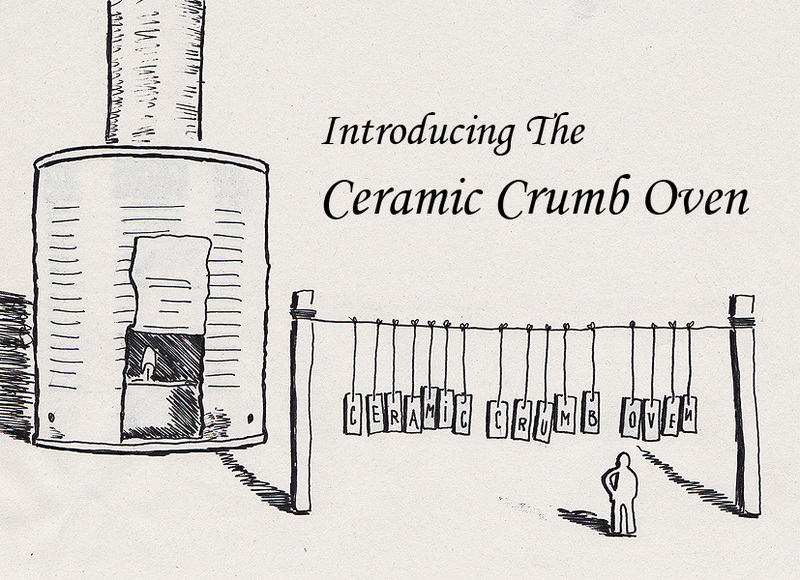 For instructions of how to build a Ceramic Crumb Oven and for tips on how to use it scroll right. 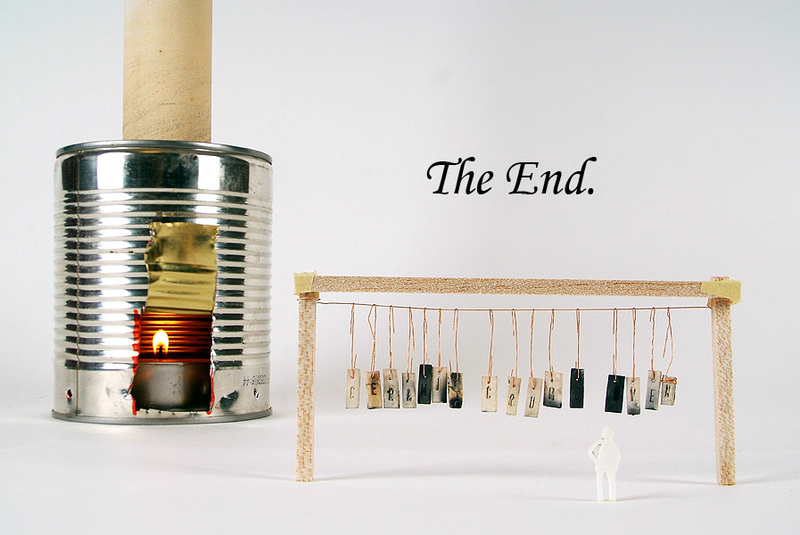 6 pairs, male and female, of international designers from Holland and Portugal experiment with firing ceramics in small homemade ovens. 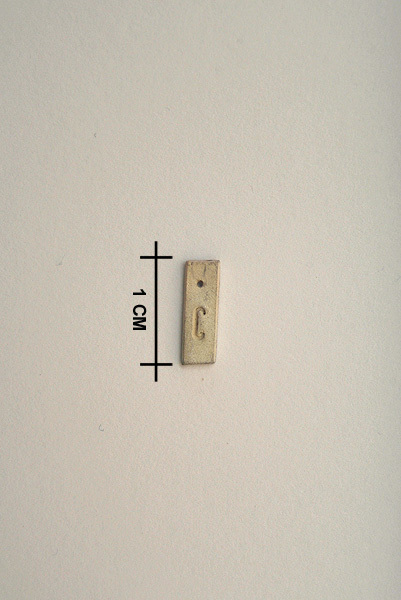 The result consists of tiny objects about "Masculine/ Feminine" that in the exhibition can be viewed through magnifying glass or microscope. Participating: BCXSY, Daniela Pais & David Luxembourg, Design Drift, Janine Braun & Pedro Almeida, Studio Joon&Jung together with Yu-hun Kim, Studio Pedrita. 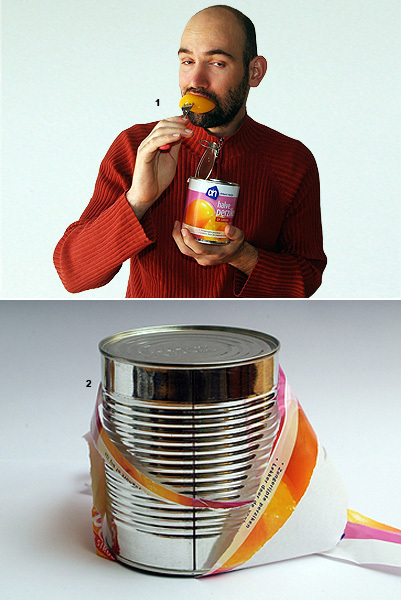 1- Eat all the peaches and syrup & empty the can. 2- Peal off the paper label from the can. Place can upside down on a table. 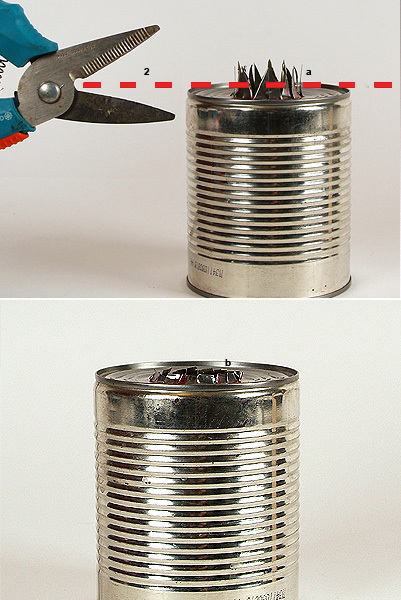 Place a prop on top of the can. 1- with the marker trace the out line of the prop over the can. 2- afterwards ad a cross in the center of the circle. 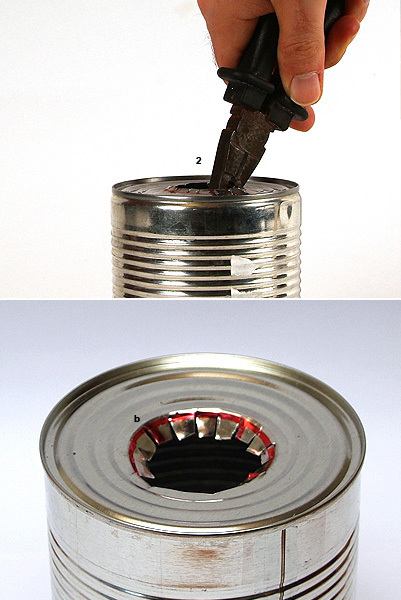 1- Using the hammer and the knife puncture the can at the center of the cross. 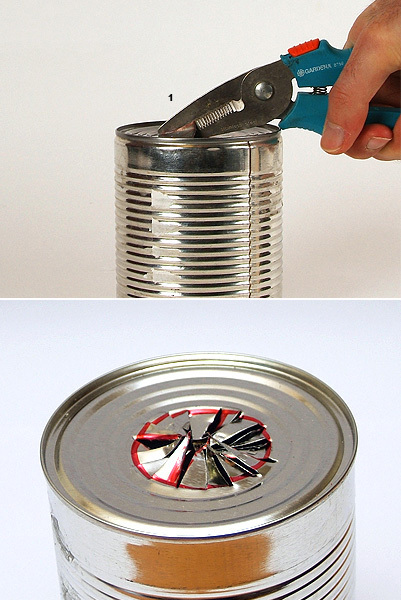 1- With the metal scissor cut the circle into 16 slices, cutting each of the four previously made slices into another 4 parts. 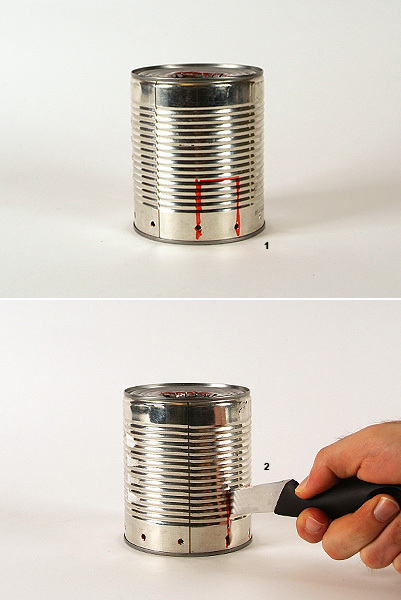 Then pull the 16 slices upwards and outwards from the can forming a little crown sharp triangles on its top (a). 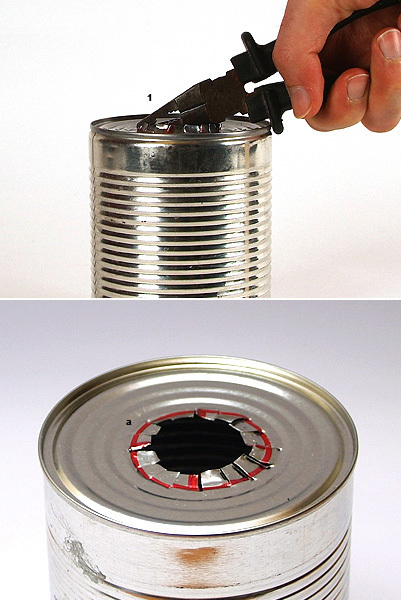 1- With the pliers press the teeth back to the surface of the can making it flat (a) with a round hole in its center. 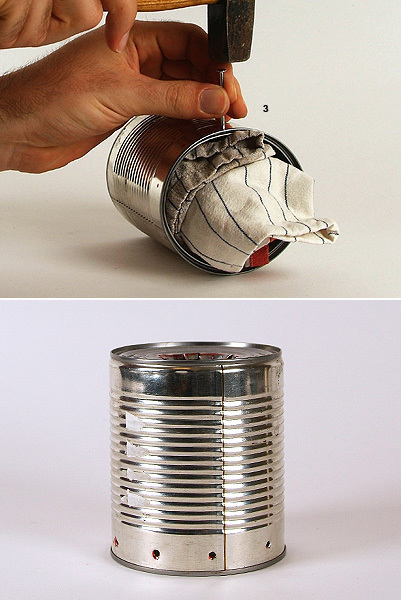 1- Stuff the can with the towel. 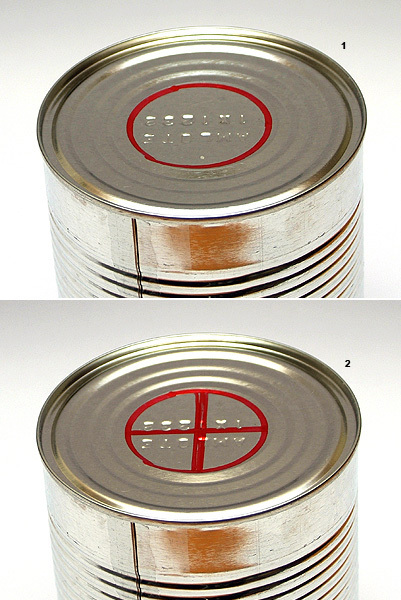 2- With the marker make a line of dots about 3cm away from each other at the bottom of the can. 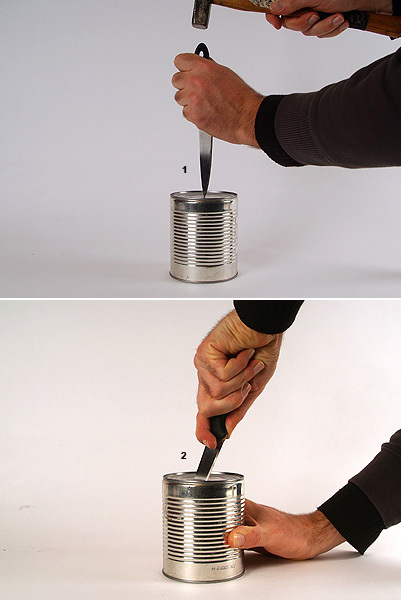 1- Draw a door between 2 neighboring holes about 3-4cm high. 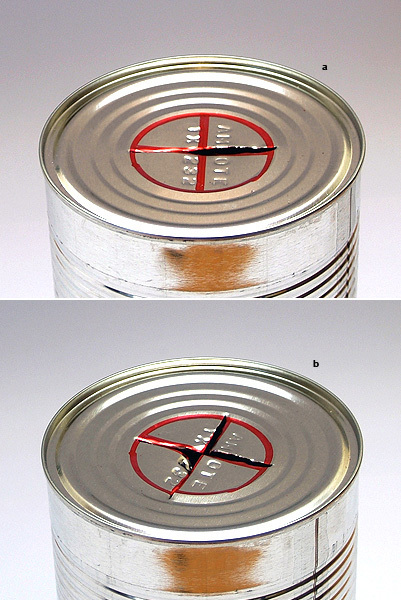 2- With the knife cut the sides of the door open. 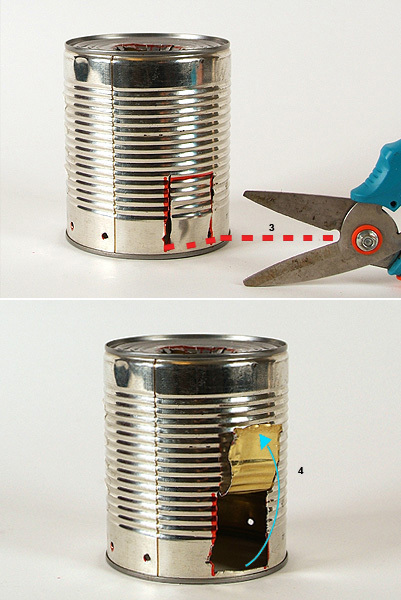 3- With the metal scissors cut the base of the door open. 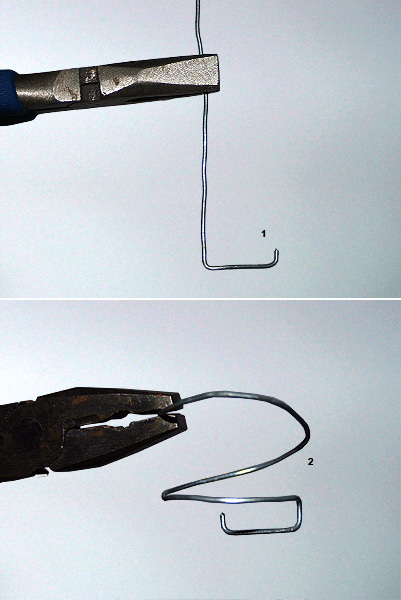 1- Flatten the metal wire and from a right-angled hook at its end. 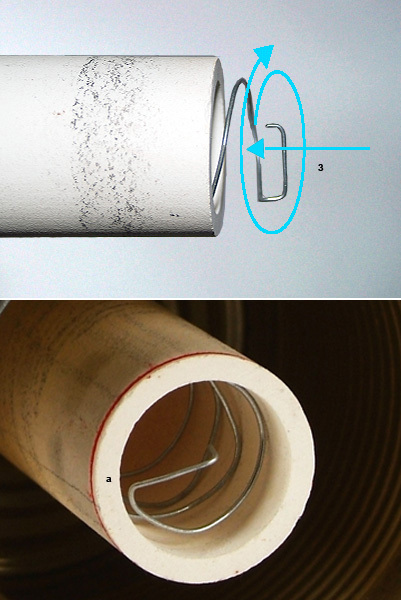 2- Keeping the hook at the end intact form a spiral from the rest of the wire with a diameter of 3.2-3.5cm. 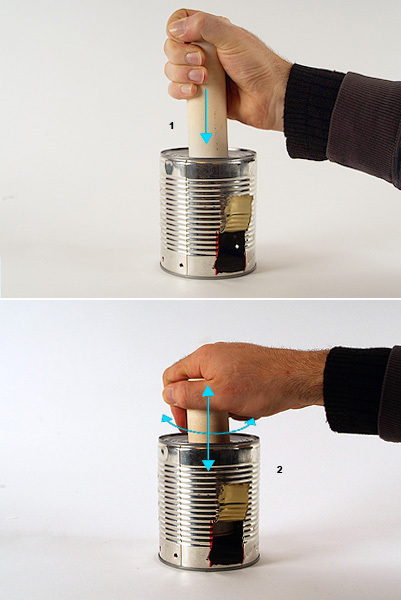 3- While rotating it insert the spiral into the longest prop so that its hooked end of is at the edge of the prop (a). 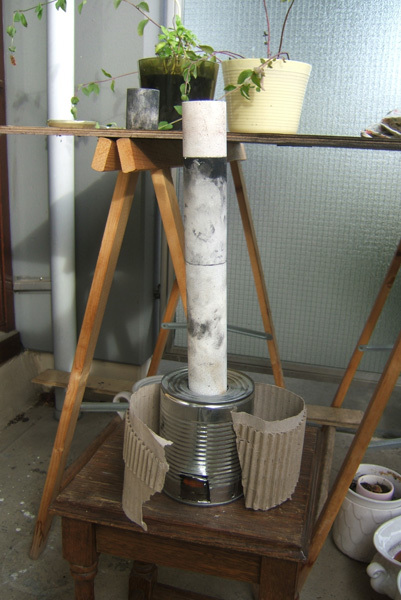 1- Put the longest prop over the hole at the top of the can and push it downwards into it - transforming the can into an oven and the prop into its chimney. 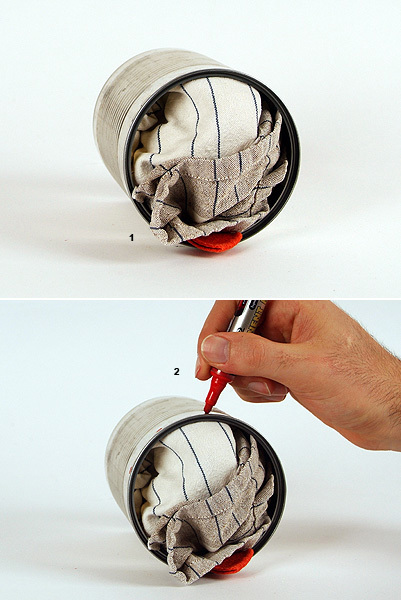 1- Make your design from clay or liquid clay. 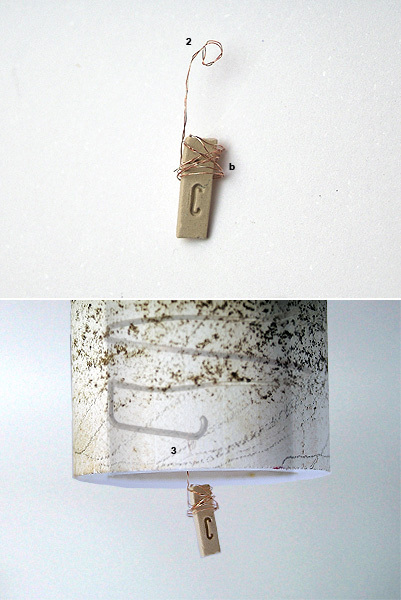 Very gently wrap your design with metal thread (a) taken from the classical guitar string 'D' or 'A' making a sort of a harness (b) for your design. 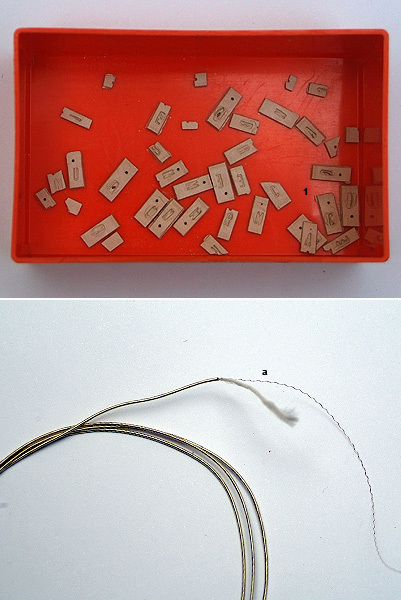 2- Then use the thread to give harness a tail with a thin ring at its end. 2- Place the oven over it. Prior to this make sure that the chimney is set to the right position or height so that your design, which hangs under the bottom edge of the chimney, is directly in the candle's flame and thus burnt correctly. 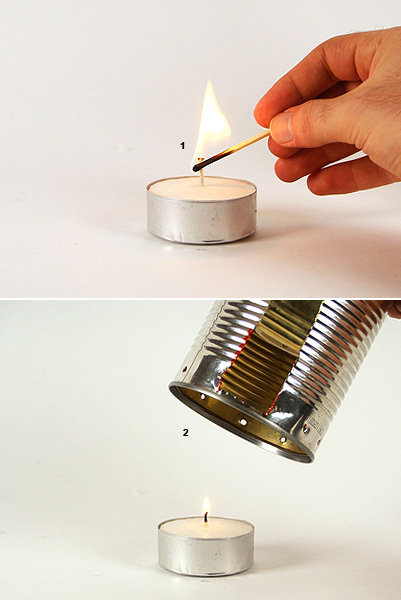 Candle Flame may look harmless but is always dangerous. Even though it is small the oven can reach very high temperatures and has a risk of fire. So use this oven with care, pay attention and please read about what safety measure you can take in order to avoid harming yourself and your environment. For instance it is best to place the oven when firing clay out side, preferably covered from wind and rain (this will help it burn more efficiently). 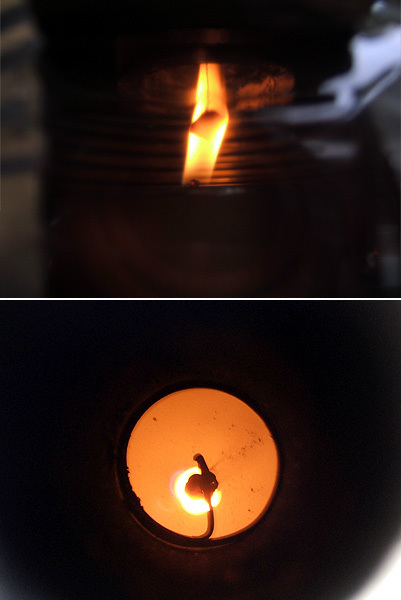 The capacity of this ceramic depends on the size of its flame; make sure that your design is always in the center of it. 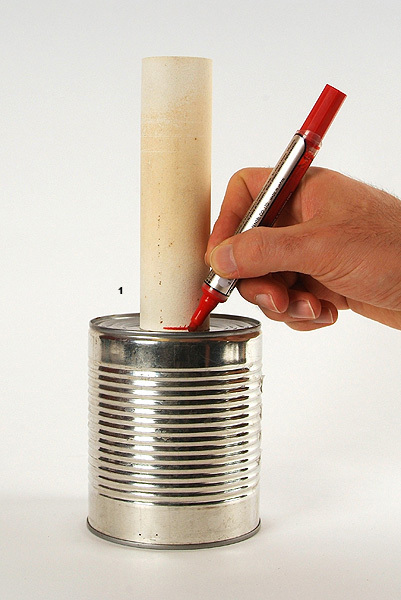 As the candle burns away check the position of your design every few hours and if needed push the chimney down very gently by applying pressure to the top part of it. Wait and let the oven cool down then remove your design from the spiral hook very gently. 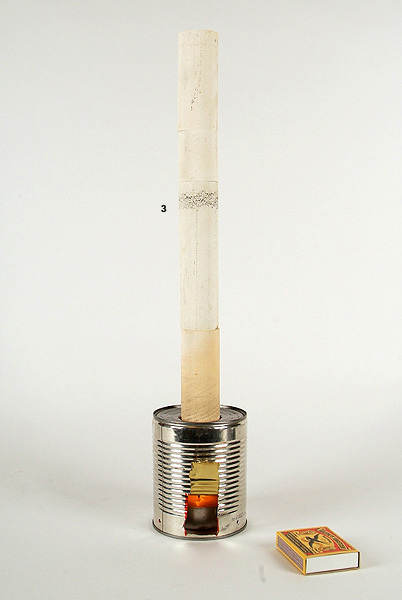 If the firing went well your item will not soften or melt when placed in water. 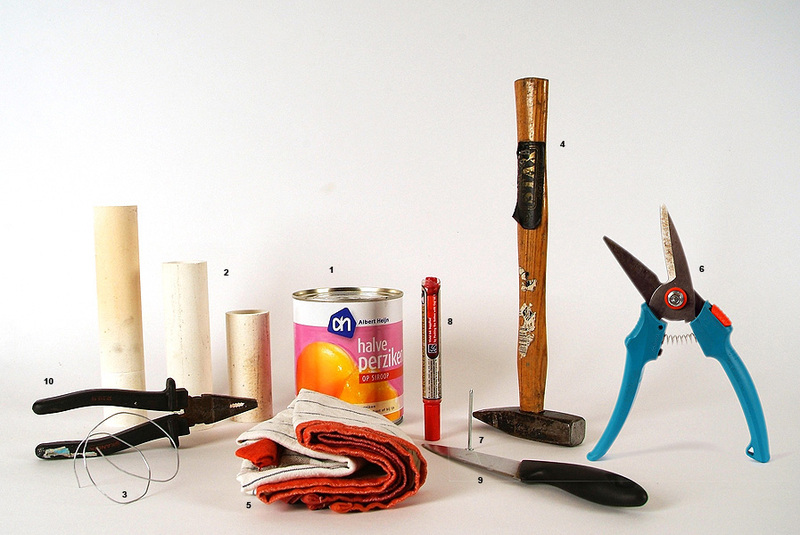 If you want you item to be black; take a soft painting or make up brush and brush the sooth on your design till it is completely black. Then wash it with water.